A Girl’s Own Adventure in the spirit of Jules Verne. Ah, I do so love adventure novels. There’s just something so breezily delicious about a madcap, feather-light dash through strange and wondrous lands – it’s almost like stepping into the pages of a marvelously illustrated picture book, where every turn bursts with the colorful and unexpected. So once again, I very much enjoyed the spectacle, and the derring-do, of this series – and though I freely admit this story, for lack of a better analogy, is something of a 2-D affair, it still is just an adventure. I guess it really all comes down to whether or not you like this type of story, as I very much do. So Verne is the popular comparison to make when it comes to this series – but steampunk elements notwithstanding, these books also remind me a bit of Robert Louis Stevenson, in how the story just pell-mells along, never once stopping to catch its breath. Now yes, that does mean the narrative swims merrily across the surface instead of diving to any particular depth of character or meaning – but honestly, that’s the genre. And really, I just can’t help but enjoy the old-fashioned feel that comes with this particular brand of storytelling – it’s almost like uncovering a new artifact from a previous era – though at the same time, it’s hardly antiquated storytelling, as the female characters with will attest (having agency to spare). Plus, I mean, flying ships! Floating worlds! Strange and bizarre alien creatures! How can you resist that sense of discovery, of adventure? And speaking of our female characters, Emilie herself is once again very much the heroine of the hour – or rather, the heroine of every ten minutes of that hour, as she still is somehow always the one person able to save the day – and there is plenty to enjoy in and about her escapades, particularly as things are a bit more personal this time around. With her younger brother tagging along, and even her repugnant Uncle making an appearance, Emilie’s past gets cracked open in this story, which leads to an airing of all kinds of family history and grievances – which I very much enjoyed. It was fun to watch the at times bratty resentments and conflicts between Emilie and her brother bubble to the surface – and I just really appreciated how it all opened Emilie up, giving her a bit more character space than in the first book. Though on the flip side, I do think Emilie’s time with the rest of the crew suffers as a result – and I mean that literally, because of course everyone still adores her, but as for clocking actual interactions, it felt like bare seconds at best. In fact, Emilie barely has any quality time with either of the Marlendes, and far too little with Daniel, for my taste – but as I’ve said above, there really is just very little time to spare for character work in this type of story, with everyone running around madly all the time. But still, I do like very much how this book builds on the first, in growing Emilie as a character. Really all in all, I think I did enjoy this book a bit more than the first – largely because the story was a bit more contained, a bit more compact; but interestingly enough, that narrower scope turned out to be both a positive and negative thing. It was a good choice, because for me the sprawl of the first book was a bit too much to credibly take in, and yet as a result of this compaction, in order to keep the action flowing at breakneck speed, the narrative ended up doing almost pretzel-like contortions to keep our characters in constant motion, which did result in some running in circles, in terms of dashing from one locale to another, then back again, then back again – you get the idea. So while my interest never faltered, it did feel at times like perhaps the story went one loop-de-loop too many – but, thanks to the more personal side of this adventure, I still was actually more invested in the events of this story than I was in the first. 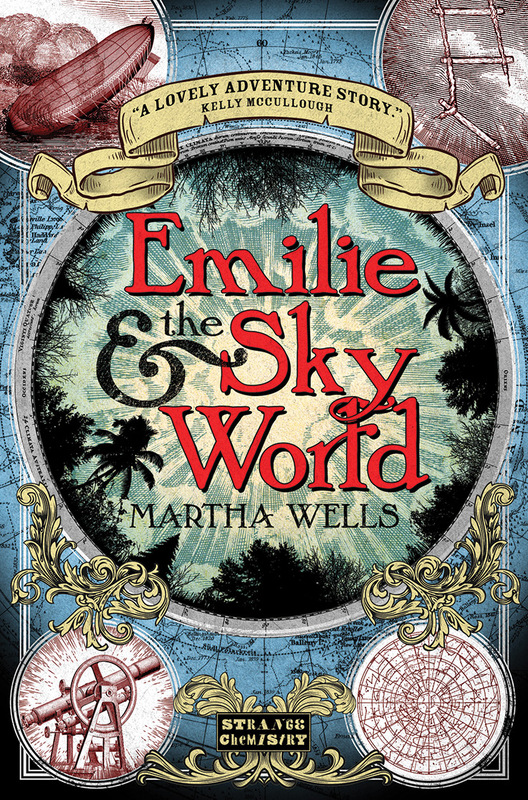 Emilie and the Sky World is a delightfully fun, fast read. I’d happily read a dozen more in this mould. I love adventure books, too. Looks like I need to look up this series – stat!